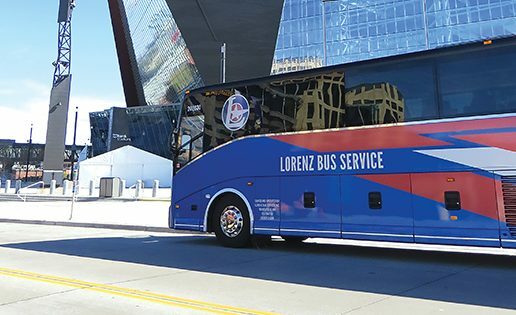 The family-owned and operated Lorenz Bus Service traverses the Twin Cities and surrounding markets with a highly-diversified fleet, including one of the largest transit bus fleets available for charter services. Jim Canine and Alan Gingold partnered over two decades ago in acquiring a small transportation company that is now a second-generation business with sons Mike and Ben Canine at the helm. 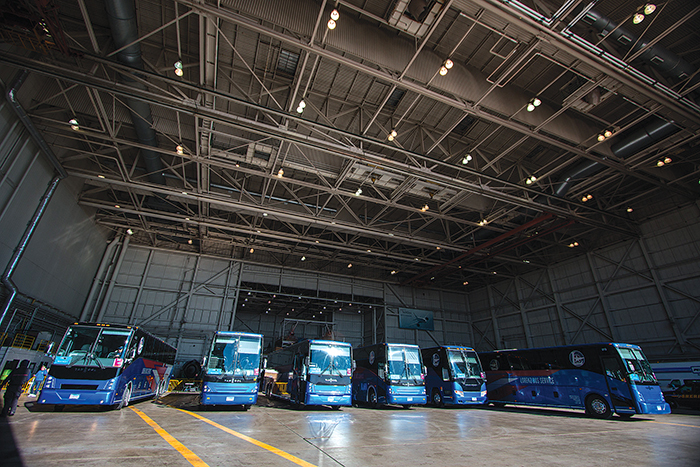 Lorenz operates 30 motorcoaches, 85 privately-held charter buses, 20 minicoaches and vans, and 125 school buses. With an average of 358 movements on any given day, Lorenz dispatch center is a beehive of activity. During the Minnesota State Fair, drivers on staff can swell from 300 to 500 people. Keeping track of drivers, equipment and route changes demands a highly organized system that monitors and adjusts for rapid change. From drivers and dispatchers to maintenance and safety operations, Lorenz has formulated a strategy and culture that utilizes cutting-edge technology and professional development to optimize staff performance and fleet utilization. “We are pretty well known in the local market as the go-to provider for high-profile events,” Mike Canine, vice president of customer experience at Lorenz, said. Lorenz is the exclusive provider of all visiting NFL, MLB and most NHL teams. Additionally, Lorenz manages the park-and-ride system for the Minnesota State Fair, the largest fair in the United States by daily attendance. Operating over 125 buses for a period of 12 18-hour days, 18 and utilizing subcontractors for around 10 percent of the volume, Lorenz provides upwards of 1.2 million unique rides for the Minnesota State Fair. The Canines are digital devotees to systems and processes that make operations more efficient and increase the amount of business intelligence and data-driven decision-making at all levels in the organization. Although only required aboard motorcoaches, GeoTab e-logging and GPS devices are installed on all school buses, transit and minicoaches to ensure compliance with Hours of Service (HOS) regulations and prevent fatigued driving fleetwide. During the Minnesota State Fair, on-site coordinators use iPads to give guests wait- time estimates. Employees communicate via Slack with multiple organized chains to ensure all are up-to-date with information about drivers, vehicles, customers and more. The company runs Coach Manager by Distinctive Systems as its charter software and Dossier for maintenance software. A proprietary interface between Microsoft Power BI with Distinctive Coach Manager lets users create business intelligence reports that reorganize data into useful sales and operational tools, accessible via an app. Lorenz implemented a Dossier/Geotab integration whereby driver defects listed in the e-logging device are uploaded into Dossier as a work pending item and immediately pushed out to maintenance and tracked in both systems. They’ve also developed a script to accurately capture engine odometer and mileage readings across all systems to check and monitor PM cycles — eliminating clerical work and human error. With its large fleet of ADA-compliant transit buses, offered to deliver economy and efficiency, Lorenz also has three tiers of motorcoach service sold by “Elite,” “Deluxe” and “Standard” options, with corresponding amenities and varying cost to provide solutions matched to each group’s needs. 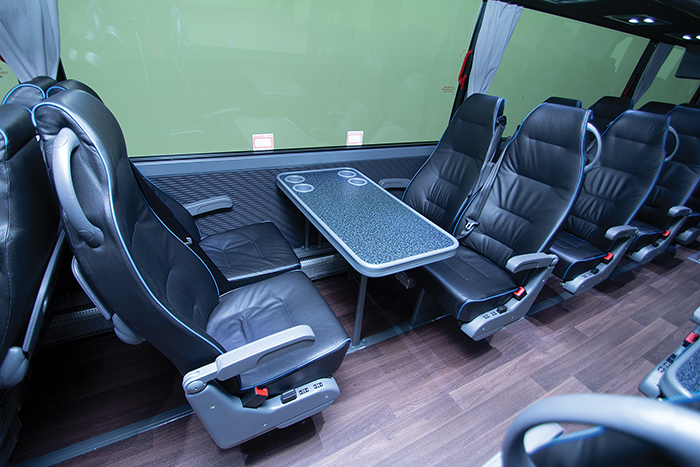 By providing consistent service from its core group of drivers and the varying specifications of its Van Hool fleet, Lorenz has seen a steady increase in bookings. “Kids going to camp may need different amenities than a corporate meeting planner intent on impressing a group of high-profile clients with an elite motorcoach experience,” Mike Canine said. Likewise, transit buses offer faster boarding and greater capacity for convention visitors via double-doors and standing room. “Our charter department focuses on the underlying needs. While not every vehicle is our most luxurious option, offering services and pricing based on need has helped us to better understand our customers and in turn deliver higher customer satisfaction,” Canine said. The key to Lorenz’s success has been the ability to adjust to seasonal variables. Along with highly-trained motorcoach drivers, Lorenz retains a seasonal labor force of school bus drivers who staff the transit buses during the summer months. In 2009, Lorenz entered the school bus industry with its first school bus contract at Spring Lake Park Public Schools — purchasing 30 of the next year’s Blue Bird buses for the contract. The investment paid off, enabling Lorenz to strengthen its ties within the local community and stabilize its seasonal charter driver base. In 2012, Lorenz purchased its 100th school bus based on an awarded contract with Columbia Heights Publics Schools. “Our dispatchers were able to combine a myriad of routes with structured charter opportunities to stabilize the business and minimize driver turnover,” Ben Canine said. Within just a few years, Lorenz became an employer of choice within the local school bus industry and is known to be one of the only local companies with stable, year-round work for school bus drivers. Driver recruiting and training is a number one priority within the organization. A majority of its motorcoach driving positions are filled by former law enforcement or professionals from safety positions. Lorenz’s Safety Department is led by Director of Safety Paul Davis, a former sergeant in the Minnesota State Patrol’s commercial vehicle enforcement unit for nearly 26 years. Renowned for his expertise statewide, Davis’ primary focus has been school bus and motorcoach safety for almost three decades. Lorenz is one of few local bus companies who employs two state-licensed third-party testers. This ensures that all drivers are trained and tested in accordance with state regulations and incorporate best practices. This enables the company to focus on hiring the right employees from the beginning, regardless of experience level. Lorenz’s training instructors are certified with the Smith System program teaching these core driving principles during the training process. Lorenz has forged a unique company culture focused on emphasizing positivity, parity and openness within the organization. Isaiah Newell, director of school bus operations, was instrumental in creating and imbedding a Lorenz core value referred to as its “any bus” philosophy. Centered around the professional development of each drivers’ skill set, “any bus” literally means drivers have the opportunity to be trained on and operate virtually any bus in the Lorenz fleet. Lorenz’s training program focuses on different “tools in the toolbox” at each level as the company trains drivers to progress along its career track from driving vans to driving minicoaches, school buses, transits, and then motorcoaches. Lorenz was one of the first bus companies locally to send all of its motorcoach drivers and trainees through a customized program taught by professional instructors at the Minnesota Highway Safety Center’s 160-acre driving range. All motorcoach drivers must complete the course, which features classroom instruction in conjunction with hands-on, closed-course driving. “Just as gas fuels the buses, human energy and engagement fuels the culture at Lorenz,” she said.